Take a look around your house and you’ll definitely find some old electronics that you don’t use. They’re just lying there, gathering dust – that old clunky inkjet printer that spits out more pages than it prints, the once sleek (but now obsolete) FM radio transmitter you’ve still kept for nostalgia’s sake, and of course, those old floppy disks with words such as ‘Dave’ and ‘Wolf 3D’ sprawled across them in your excitable hand that you just don’t have the heart to throw out. There’s this and so much more electronic junk we have in our lives that we just don’t know what to do with. From televisions to hair curlers and everything in between, we either horde all these worthless electronics even after they’ve completely overshot their ‘sell by’ date, or we chuck them in the trash bin. And both approaches are bad! The latter more so than the former. You have a few other options apart from making a shrine to useless electronics or shooting them down the (trash) chute. Judging by the pace at which the world of electronics is evolving, the prospect of reselling your old gear is a moot one. What you can do is donate. Especially if you have computers or IT peripherals like printers and the like. Schools for the underprivileged, orphanages and other similar institutions will gladly accept your stuff, so why not help improve our society and get rid of your old junk all in one shot? So dust off that old backup laptop that you haven’t touched in years, the old iPad you’ve relegated, half-forgotten to the bottom of your drawer, or that scanner you bought for that one project and then never used – and donate it! 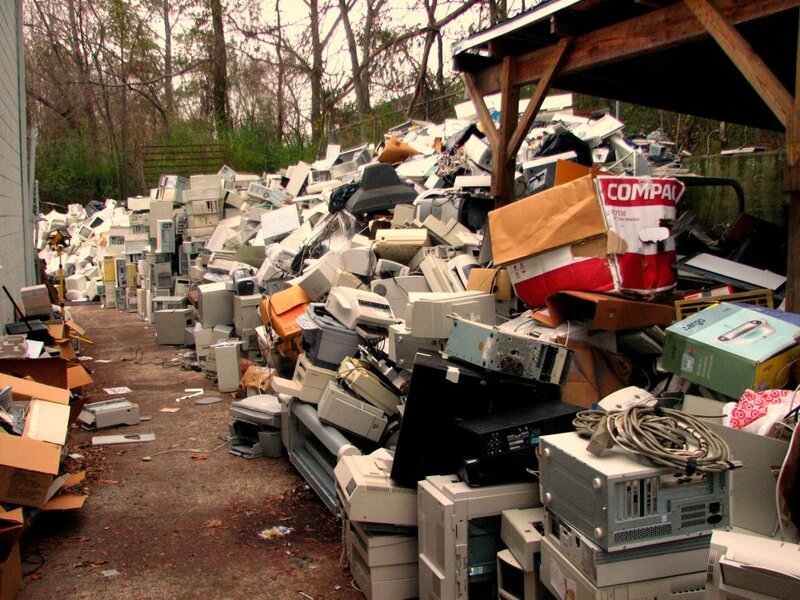 Of course, most of our electronic waste is lying around because either it is too obsolete or it doesn’t work anymore. Now this poses a bit of a problem because most people would rather not go through the hassle of recycling their electronics because they aren’t covered as part of the ‘recyclables’ collected by most city and county garbage disposal programs. But here’s why it’s important to recycle e-waste. According to this piece in the Pacific Standard magazine’s website, electronics that aren’t recycled here in America, end up in landfills in third world countries like most of Africa, China, India, Pakistan and the Philippines. Here, they are stripped down, even the smallest useful component is scavenged, and the rest is left to rot. This includes all the toxic elements that are usually contained in old electronics that end up seeping into the soil, contaminating these places, and leading to all sorts of diseases and illnesses. However, if you take your electronics to authorized scrap metal recycling centers, they are actually processed, and then either refurbished and resold. If there isn’t anything to be resurrected from them, they are melted or shredded and sold as raw material for reuse. And in case you were wondering about what happens to the aforementioned toxic components when they reach scrap yards, they are separated from the electronics and disposed of as per official government regulations, rather than being palmed off to third world countries. The whole process is very articulately explained through the medium of this infographic created by Sims Metal Management, who, being recyclers themselves, knows what they’re talking about. Finally, not only are you making the world a better place to live in by recycling, but you can also earn a quick buck while you’re at it. Metal scrap yards will usually pay you a certain amount of money for your old equipment. The amount will vary based on the material used in said equipment and how much they weigh. So the next time you’re lazing around on a balmy Sunday afternoon, why not round up all your e-waste and either donate it or take it to the recycler’s? As responsible citizens, it is the right thing to do, not to mention, your homes will be that much less cluttered through your efforts, too.